After graduating Toho Gakuen with top grades, graduated from The Curtis Institute of Music, and studied under the likes of Milstein, Vegh, and Gitlis at Morzarteum University of Salzburg. 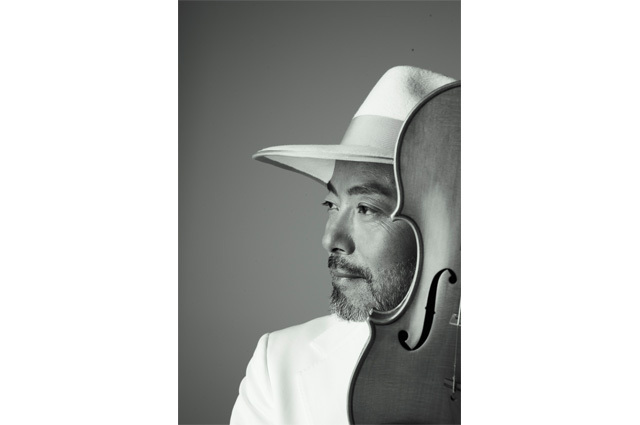 Has performed alongside internationally acclaimed artists such as Yo-Yo Ma and Stephane Grappelli. Won 1st place at the Nippon Ongaku Concours. In 1986, formed a band with Taro Hakase and incorporated lighting and talks, which tread the path for their current pop style staging. In 1993, album featuring the commercial song for “Peace Light Box” appeared on the Oricon chart. In 2006, transferred to “HATS” after performing with Taro Hakase for the first time in 20 years. Next year, released “Dandyism” and “Dandyism Gold”. In 2007, won the “Best Dresser” award. In 2008, “Kaimin C ‘Dreams’”, in which he took on the role as musical director, won “Gold Disk Instrumental of the Year” award. In spring of 2009, formed “Violin Brothers” with Taro Hakase, and went on a national tour. Released the album “Dandyism Vintage”, featuring the song “Avernier –Inori no Mori-“, a song dedicated to the Meiji Shrine.